I first heard the name of Dr. Howard Hendricks from Bruce Wilkinson's book. Since then I have been a fan of his books. Dr. Hendricks was a well known and loved professor at Dallas Theological Seminary before he passed away earlier this year. 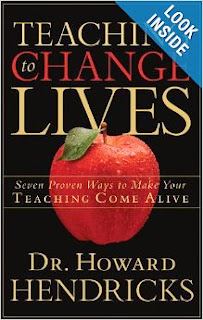 A few months ago -to my husband delight- I cut down my book collection to 1/4, leaving me with only books that I love and will re-read and this book: Teaching to Change Lives survived the massive purge. Years ago I took part in a Sunday School Convention. During a lunch break, three of us who were teaching at the convention went to have lunch. We met an 83 years old lady from a church with a Sunday school of only 65 people, she taught a class of 13 junior-high boys. She traveled by Greyhound bus from Michigan to Chicago the night before the convention. Why? In her words, "To learn something that would make me a better teacher." Eighty-four boys who sat under her teaching are now young men in full-time vocational ministry. Twenty-two are graduates from the seminary where I teach. I believe the secret to this woman's impact is her passion to communicate. My heart's concern for you is that God will give you a passion like that...and never let it die. And I hope you never get over the thrill that someone will actually listen to you and learn from you. This book is about seven strategic concepts in teaching, and you'll notice we're calling them "laws" - principles, rules. Effective teaching comes only through a changed person. The more you change, the more you become an instrument of change in the lives of others. Spiritual development is only a part of the larger process. It can't be our sole concern. Maintain a consistent study and reading program. Understand that leaders are readers, and readers are leaders. Get involved in reading people as well. One of the greatest lessons my father taught me was this: Whenever you're around a significant person or those who know more than you, keep our mouth shut except to ask penetrating questions. A good teacher is a good listener. Enroll in continuing education courses - courses that will improve not only your content, but also your skill. The most important is your own personal Bible study program. Get to know your students. Find out as much about them as you possibly can and pray over them. Never give label such as "she never talks" he is the troublemaker" and so on. Remember kids with enough creative energy to get into trouble can have enough drive to live highly significant lives for Jesus Christ later on. Is your money under control? How about your time? If you don't control your time, someone else will - someone who doesn't have your priority system. Is your thought under control? Remember garbage in garbage out. Is your diet under control? Do you exercise? Do you get enough rest? Who do you have in terms of friends? Do you know anyone who believe differently than you? in different age groups? different walk of life? Enrich your circle of friend. Continue to make and build friendship. The world screaming need is to see men and women who know the living Word of God, who are constant students of that Book, and who allow it to grip them so they grow to hate what God hates and to love what God loves. To be an effective teacher, you must not only know your content but also your students. How people learn determines how you teach. The teacher is primarily a stimulator and motivator...not the player, but the coach who excites and directs the players. The learner is primarily an investigator, a discoverer, and a doer. The ultimate test of teaching is not what you do or how well you do it, but what and how well the learner does. Good teachers can't be focused on what they do, but on what their students are doing. 1. Teach people how to think. Good teaching and true education consist simply of series of teachable moments. 3. Teach people how to work. Never doing anything for a student that he is capable of doing for himself. If you're going to teach students to think, learn, and work, then help them master four basic skills: reading, writing, listening, and speaking. Failure is a necessary part of the learning process. C. The Law of Activity: Maximum learning is always the result of maximum involvement. "I hear, and I forget. I see, and I remember. Studying the life of the Savior, the greatest Teacher, makes it clear that he didn't cram a lot of heads full of a collection of theological facts. No, he involved his disciples in the process.